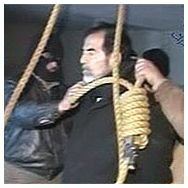 Saddam deserved to be executed. This was good, noble, honorable and just under God’s righteous laws (Roms. 13:1-7) for the numerous atrocities that he had committed against hundreds of thousands of his own people; and the world at large. He is receiving the due penalty for his actions—and they were without equivocation, humility, nor repentance unto the end… he reaped what he sowed. I realize that this a time of conflicted emotions: on the one hand, we rightly rejoice that justice was measured and accomplished—something very rarely seen in our moral pluralistic, sentimental world today. On the other hand, it is not a time for celebration—for God does not delight in the death of the wicked. “Say to them, ‘As I live!’ declares the Lord GOD, ‘I take no pleasure in the death of the wicked, but rather that the wicked turn from his way and live. Turn back, turn back from your evil ways! Why then will you die, O house of Israel?" In this one verse we see both compassion and chastisement—the longing forbearance and mercy of God AND the certainty of impending judgment. “The wages of sin is death” (Roms. 6:23); and because it is impossible for God to lie (Heb. 6:18), He remains faithful to His Word, to His character, and to His judgments (Psalm 19:7-11). Because He is loving, He delights not in the death of the wicked; but because He is holy, sin cannot be tolerated and certain judgment must come. “The wrath of God is His eternal detestation of all unrighteousness. It is the displeasure and indignation of Divine equity against evil. It is the holiness of God stirred into activity against sin. It is the moving cause of that just sentence which He passes upon evil-doers. God is angry against sin because it is a rebelling against His authority, a wrong done to His inviolable sovereignty. Insurrectionists against God’s government shall be made to know that God is the Lord. They shall be made to feel how great that Majesty is which they despise, and how dreadful is that threatened wrath which they so little regarded. Not that God’s anger is a malignant and malicious retaliation, inflicting injury for the sake of it, or in return for injury received. No; while God will vindicate His dominion as the Governor of the universe, He will not be vindictive. The Lord changes not (James 1:17-18); He is the same yesterday, today and forever (Heb. 13:8). He cannot be tempted (James 1:14-16); He is no respecter of persons (Roms. 2:11); and therefore, is faithful to Himself to carry out the certainty of eternal punishment against the faithless (2 Tim. 2:13). Strong words that pierce my own heart even as I write. Saddam was heaping wrath upon wrath in the day of wrath—a day which has now come to him. And we must remember, that apart from the grace of God beloved, that would be me or you. God is sovereign; all things work for His glory according to His divine purposes and plans (Eph. 1:4-14). He is not swayed by political expediency, moral servitude, or virtues of our own design. He is holy and measures us all only by the standard and perfection of His holiness. That is why all our righteousness is nothing but filthy rags before Him (Is. 64:6). The wicked He uses to accomplish and bring to fruition His own eternal intentions. “The Potter” receives equal glory in fashioning both vessels of wrath and vessels of mercy from the same clay (Roms. 9:14, 18). He is just in the saving of some and in the condemnation of others (Roms 9:19-26). And there is no injustice with God (Roms. 9:14). But God “takes no delight” in Saddam’s death… Because at the moment of his last breath he entered everlasting perdition and now has knowledge of his torment; of the Lordship of Jesus Christ; the eternal plight of his sin; the futility of the Islamic faith; and has but tasted of God’s holy wrath—for one day, he will receive a physical body in which he will suffer and be tortured night and day forever and ever without relief or reprise by the wrath of a holy God. It is a punishment the weight of which no man can fathom in this life. Saddam has been under the wrath of God all of his life (John 3:36); but he now knows the realty of such divine anger. He is conscience; he is suffering; and he is eternally damned. All who reject Jesus Christ and His gospel are under God’s wrath—and there are no exceptions (John 14:6). ”Yes, many there are who turn away from a vision of God’s wrath as though they were called to look upon some blotch in the Divine character, or some blot upon the Divine government. But what saith the Scriptures? As we turn to them we find that God has made no attempt to conceal the fact of His wrath. He is not ashamed to make it known that vengeance and fury belong unto Him. His own challenge is, "See now that I, even I, am He, and there is no god with Me: I kill, and I make alive; I wound, and I heal; neither is there any that can deliver out of My hand. For I lift up My hand to heaven, and say, I live forever, If I whet My glittering sword, and Mine hand take hold on judgment; I will render vengeance to Mine enemies, and will reward them that hate Me" (Deut. 32:39-41). A study of the concordance will show that there are more references in Scripture to the anger, fury, and wrath of God, than there are to His love and tenderness. Because God is holy, He hates all sin; And because He hates all sin, His anger burns against the sinner: Psalm 7:11. 3. because God does not delight in the death of the wicked, then we must not either. Our emotions must be constrained by Scripture alone. In the shadow of the execution of this iniquitous world tyrant, may the certainty of eternal judgment (absent of regeneration through Jesus Christ our Lord) be forefront in our minds and drive us to tell others about the gospel. As profoundly expressed by the Apostle Paul, may the burden for lost people weigh so heavy upon us, that we, out of the anguish of our own souls for their unregenerate state, would be willing to bear the yoke of our own damnation so that others might be saved (Roms. 9:3). Beloved, our lives are a vapor (James 4:11); we live once, we die once, and then the judgment (Heb. 9:27). So may I entreat those who do not know Christ to flee… flee to Him; and "flee from the wrath to come" (Matt. 3:7). Do not harden your heart while “today is called today” (Heb. 3:-4) and it be too late for you as it is for Saddam. Do not be contented by thinking you have already fled to Christ. Make certain! Beg the Lord to search your heart and show you yourself. Test yourself to see if you are in the faith (2 Cor. 13:5). And if not, repent of your sin, trust in Christ alone, through faith alone, by grace alone for the hope of the salvation of your souls (Roms. 3:21-26). Flee all other means to salvation whereby you may find some glory in your own works, deeds or religious practice. Come to the end of yourself--"deny yourself, take up your cross and follow Him" (Matt. 16:24). "If you confess with your mouth Jesus as Lord, and believe in your heart that God raised Him from the dead, you will be saved; for with the heart a person believes, resulting in righteousness, and with the mouth he confesses, resulting in salvation" (Roms. 10:9-10). May the love of God compel us to proclaim His gospel of grace to all in our world while we are still granted time on this earth to serve the Lord Jesus Christ. For even the day of our having to give an account to the Lord is closer than we think. “Knowing the terror of the Lord, we persuade men…” (2 Cor. 5:11a). And I am glad this wasn't a gleeful post of celebration. God is just--but He doesn't celebrate the death of the wicked. Steve, what an excellent post on this issue. Just as Pilgrim said, I too, am glad this wasn't a "gleeful post of celebration". While the world can say justice is done and that he deserved to die, which he did, it is still sad to see someone, anyone, end up in eternal torment. "Do not be contented by thinking you have already fled to Christ. Make certain! Beg the Lord to search your heart and show you yourself. Test yourself to see if you are in the faith (2 Cor. 13:5). And if not, repent of your sin, trust in Christ alone, through faith alone, by grace alone for the hope of the salvation of your souls (Roms. 3:21-26). Flee all other means to salvation whereby you may find some glory in your own works, deeds or religious practice. Come to the end of yourself--"deny yourself, take up your cross and follow Him" (Matt. 16:24). Since this morning I have been struggling with my emotions concerning this execution. Your post has straightened them up for me. Now I know that my NOT following the official line of European Union's condemnation of the execution is, in fact, in line with my faith. How many more tyrants do we have to see in order for the world to finally understand who is really in control? Very Sobering. May we never be found to laugh at death and Hell. It is a horrible thing. Woe to you that laugh now. For you shall weep and mourn. Thanks for not making a celebration of this event. The Lord is just and may his name be praised and glorified. Excellent, excellent, excellent Steve! A perfect blend of the uncompromising holiness, righteousness, justice of God...mixed with his love. Another quality that we don't think of in the long list of attributes of God is that of wrath. He is a patient God...and He delays judgment to enable people...give them the time to listen and repent. He is longsuffering...but one day there will be judgment and justice. That judgment can be abated for those who have accepted Jesus Christ as their Lord and Savior...and received His sacrifice on the cross as payment in full for the penalty for their sin. Or...they can remain stubborn and unrepentant...and reap at a time of God's choosing the penalty for their sin. There are several problems with this. 1) We don't know what that day and hour will be. 2) The consequences that we pay for here on earth...are small in comparison to the eternal, unending punishment that we will receive if we fail to accept the one true, acceptable sacrifice as payment for our sins. Yet...His heart doth break at each soul which chooses to go their own way rather than to receive the gift that God paid through the death of His Holy, Righteous, Just, Perfect Son Jesus Christ...our Lord and Savior. You handled the tension between the two so well. This kind of commentary glorifies God and edifies the saints. Do we require more of you than that? NO. Great stuff - balanced and dead-on scriptural. Funny, I just ran across your Justice album the other day and played it for the first time in years.